Manufacturing, Trading , Importer and Exporter of Commercial and Outdoor Light. 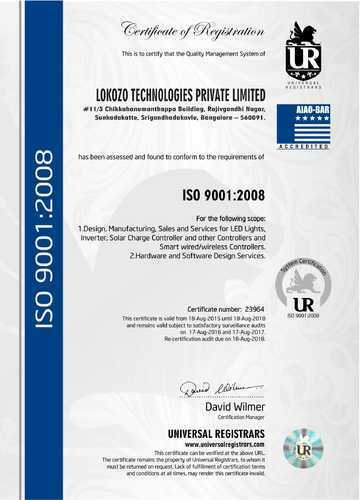 Lokozo Technologies Private Limited was established in the year 2013, has created a renowned position in the market. Our company has located at Bengaluru Karnataka, India. We are the leading Manufacturer and Exporter of this domain, engaged in offering LED Down light, LED Batten Light, LED Street Light and many more. Further, our company is facilitated by advanced automatic production equipment that are capable of manufacturing products in bulk that are timely delivered at our clients end. Our exporting countries are Sri Lanka and Nigeria. Under the supervision of Subrata Saha, our firm is achieving heights of achievement. We also provide various amenities to the patrons to put their demands forward and get them solve timely and as per their requirements. At Lokozo, we never stop challenging the limitation in all aspects to create the ideal and stylish LED products for the emerging Solid-State Lighting field. With accomplishment in R&D, we wish to transform our expertise in LED technology to functional applications that will not only enrich our life but promote a better living environment for the global community as well. We have an infrastructure incorporating the highest standards possible utilizing the best material and manufacturing techniques. Our infrastructure is equipped with advanced automatic production equipment that is capable of high production at economical cost. Our company has an infrastructure incorporating technically advanced manufacturing unit with modern technology that suits customer requirements. Lokozo' is investing in the research and development of solar products, solutions, and innovations creating a wide range of proven and reliable innovative solar products for the entire market. To provide innovative end to end energy solutions that benefit the customers through the usage of latest technologies with highly reliable, affordable, safe and clean energy solutions. Over the next 10 years to be responsible for more than 50% of all rural and urban solar electrification projects through our innovative solar products and home automation products. Delivering optimum end to end solutions to customers through hybrid, solar and LED based technologies for power and lighting. Lokozo's mission is to invest in the research and development of solar and Home Automation products with innovations creating a wide range of proven and reliable innovative products for the entire market. Mr. Rupan Sarkar Co-Founder and CTO, LOKOZO Technologies Mr. Rupan Sarkar completed his B Tech in Electronics and Engineering from Manipal University in April 2009 and worked with leading multinational companies like Schneider Electric and General Electric (GE). Mr. Rupan Sarkar is also the winner of GE Edison Challenge 2008 and Schneider Innovation Challenge 2008. He has six years of solid industry experience in core fields and two patents. He has extensive experience with design and development of power converters utilizing mixed signal components such as microprocessors, DSP, and a variety of logic as well as analog components. He has been intimately involved with complete product Design & Development life cycle. Mr. Subrata Saha Co-Founder and CEO, LOKOZO Technologies Mr. Subrata Saha is the co-founder and CEO at LOKOZO Technologies. Mr. Saha completed his B.Tech in electrical Engineering from IIT, Kanpur in 1984. After which he joined the corporate world as Senior Manager in Bharat Heavy Electricals Limited for 15 years. Continuing his journey he worked for Wipro Technologies as Technical Manager, Mind Tree Ltd as Vice President and Violet 3D as CTO and Vice President Engineering before founding Lokozo Technologies Private Limited.